I want to write page after page after page. My fingers can’t fly fast enough across the keys. I would be writing with paper and ink, but then I couldn’t see. Memories are overflowing through my fingertips and my brain can’t take it all in. Everything is happening at once and it feels like it’s been ages since I’ve felt so much at the same time. After living a simple life for so long, I don’t know if I can ever get used to so much happening every single day. This adventure is massive. So much has happened that I don’t know how to think. Yet, nothing ever really stops happening anymore. There’s hardly a moment to check your mind in the mirror, so hang on tight and ask for advice. They say the city never sleeps, but I never imagined it like this. As much as I love living so much all at once, I’m not sure how long I can do this. I’ll live it to the fullest, but one day, God, please give me a place to rest. Everything is always changing, nothing stays still. You have to keep up, don’t let yourself be idle. When you have so much in reach, idleness is harder to climb out of. The city never sleeps, and neither does my mind. With so much to process, it’s a wonder my body even rests. My mind wanders miles away each night and I’m not sure it always comes back. I’ll set my roots so firm in You. Nothing will shake me, not even this crazy city life. If I trust only in You, all of this will be for the best, even when it makes no sense. I’ve gotta let go, fall face first into this life. Because with You by my side, I have to know that everything is going to work out right. You never let me down. Today marks four years since I began writing. To be honest, I never imagined going this far with it. When one of my close friends bugged me until I made a blog, I never imagined sticking to it this long. I never imagined becoming a freelance writer, or almost reaching 10,000 views on this little site. 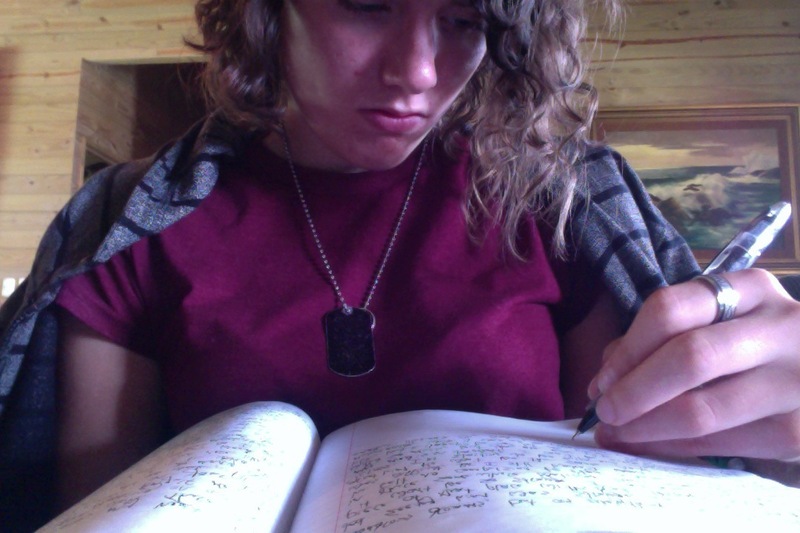 Since that day, I’ve not only been writing here, but I’ve come up with tons of little stories, poems, ideas, everything. It’s all been scattered, it’s always all over the place, but I’m so grateful. On this unusually stormy California afternoon, I have learned a valuable lesson about resting in and finding peace in God. Four years ago, I wasn’t worried about today ever happening. Today is no day to begin worrying about tomorrow. As my writing journey continues onward (to who knows what end), I place my hope and faith in the fact that I will write for him. as the sun bakes the ground. the heart is hard to please. The leaflets were known to spread life. Starting in the garden, they reached to the rest of the yard and then, one day, the entire world. Ellie and Clara cared for many of the seeds in the northern corner of the southern patch in the main garden. Clara herself was a young leaflet, fresh out of the ground. The garden was so incredibly vast, she could hardly imagine the rest of the yard, much less the world. However, they both seemed to know that their little patch was exactly where they needed to be. As they cared for the seeds, they watched them sprout to life for the first time. Children of light in a world of shadows. Great towers cast shadows over the entire garden, but the leaflets brought light from the Sun into their patches, spreading to the entire garden and beyond. Day after day, Ellie and Clara poured sunlight into their new seeds. “It’s fine, just help me with this struggler.” Clara passed a parched seed over to the older leaflet. “Aw, this one has promise.” Ellie poured strained more of the sunlight into the little seed. “I don’t know how much longer we can keep pouring into them like this.” Clara sighed and wiped her forehead. “They’ll be a lot of work, even more after they’ve sprouted.” Ellie commented, picking briars away from the edge of the patch. “Spry little saplings,” Clara laughed. “One day.” Clara covered the last seed with a smile. Every now and then, my journals run out of pages at perfectly opportune times, such as at the beginning of a new journey, or in this case, a new year (rather a week into it). 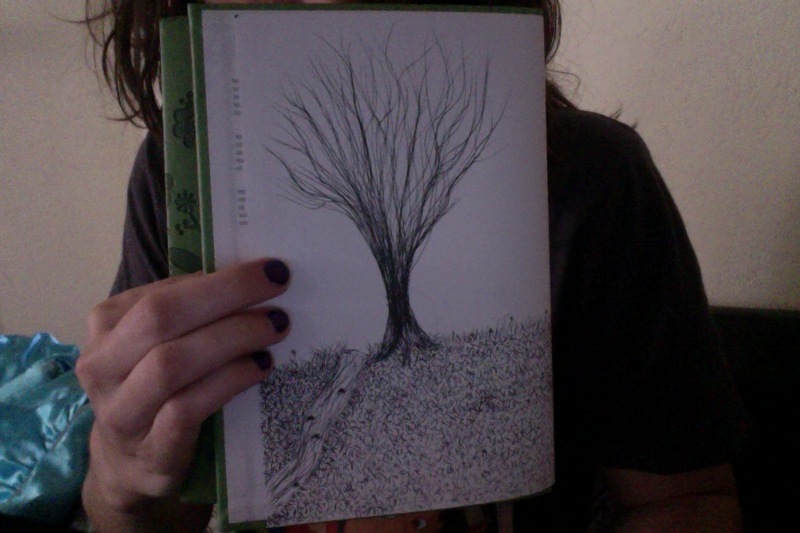 At the closing of my last journal, a tree sprouted spontaneously. As I penned each blade of grass, it occurred to me how delicate each piece of my sketch was, how every line formed an image. I realized, as I was drawing in this rare moment how delicate life is. Papi has drawn every beautiful line, each stroke, down the the smallest blade of grass to pull together this magnificent story. As I closed one journal full of the most eventful and amazing piece of my journey yet and opened an empty one, I was breathless. Life is such a delicate thing, and I am so blessed to play this part in such a grand story. I can hardly wait to see how these pages are filled. I wrote myself a character and I loved them dearly. I made him sweet and young, innocent and curious. He held my hand as I penned out his dark hair and the freckles on his nose. I wrote him a house and a family, I even penned him friends and the habit of blinking excessively when he was tired. I gave him arms and legs, but they wouldn’t be strong. I realized that they couldn’t simply be strong from nothing, so I penned him the desire to run and his legs filled in with muscle. I wrote him to be curious, so he explored the corners of life. The more adventures he took on, the wiser he grew. He wasn’t very strong of mind, though, for everything made since. So I wrote him a puzzle, something he couldn’t comprehend. He turned away from me with a pout, saying I’d left him alone. His freckles were a flash before my eyes as he refused to let his meet mine. I wrote him clues and guided him silently as he worked along the path, until he solved the puzzle in time, he ran into my arms at long last. Though I wrote him a puzzle, I always penned him the answers. He revolted at my challenges, but the more he faced, he saw the truth. I wanted to write him to be brave, but my pen faltered and refused, for it was never so simple. So I penned him challenges and terrors that he had to face. At first, he ran. He had no ounce of bravery within him, but I wrote him hope and I stood by his side as he faced the darkness. I wrote him as kind, but as battered souls challenged him, his kindness wore thin, so I gave him love and patience to bear up with it. To give him patience, I had to leave him stranded and alone. He grew angry, but I gave him peace. His anger burst into tears as he cried out for me. I penned him comfort and I sent him strong friends, and they struggled in conflict. I watched him grow and fall with them, and he turned from me to them. I meant to write him as loyal, but he turned his loyalties away from me. He ran with his friends and loved them alone. They turned on him and left him alone until he cried for my return. I lifted him out of the mud and penned him great sorrow, but in that sorrow he found joy. He blinked and nodded, his soul was weary. I penned to him refreshment and and encouragement, I cleansed him with new life. His face shone once again. I penned him forgiveness through all that I had shown him, and he chased after his friends with my hand in his. I stroked the hair from his face and saw that his freckles were barely visible. He had grown strong, wise and loving. He was kind and forgiving, and the bravest of all. As he stood before me, I smiled. His journey did not end there, no. That is when his journey began.